(W) Geoff Johns (A) Oclair Albert, Ivan Reis (CA) Rodolfo Migliari, Ivan Reis. 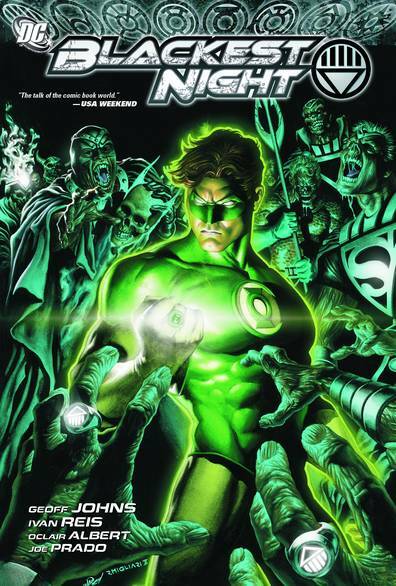 Written by GEOFF JOHNS Art by IVAN REIS and OCLAIR ALBERT Cover by IVAN REIS and RODOLFO MIGLIARI The prophecy of The Blackest Night descends in this trade paperback collecting the best-selling BLACKEST NIGHT #0-8. Now, Hal Jordan and the Green Lantern Corps lead DC's champions into battle to save the universe from an army of Black Lanterns made up of the DCU's deceased heroes and villains! .